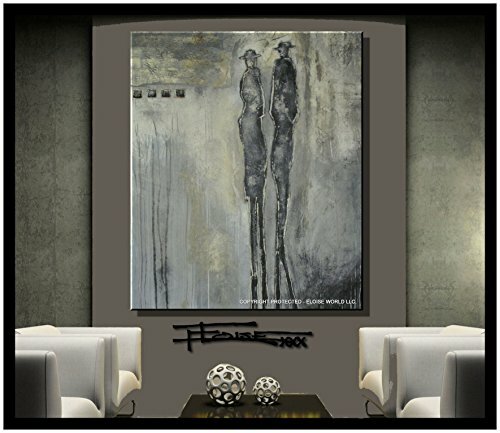 Eloise World Studio - ELOISExxx Abstract Canvas Painting Limited Edition Giclee Textured Wall Art Framed 36in. x 30in. x 1.5in. Oil WALKING IN RAIN by ELOISE WORLD STUDIO - ELOISExxx at When Art Imitates Life. MPN: 30 X 36 X 1.5. Hurry! Limited time offer. Offer valid only while supplies last. Limited Edition run of only 100. Direct from studio ELOISE WORLD. Amazing, thought provoking textural abstract painting by top selling U.S. artist. Limited Edition run of only 100. Direct from studio ELOISE WORLD. Amazing, thought provoking textural abstract painting by top selling U.S. artist. Each piece is hand textured, signed and numbered by the artist. It is finished with a hand applied gloss varnish. Once the edition is sold out the piece is then retired. ELOISExxx paintings have been collected in over 12 countries worldwide. We stand behind all of the work to ensure high quality standards and customer enjoyment for many years to come. If you have any questions about this product by ELOISE WORLD STUDIO - ELOISExxx, contact us by completing and submitting the form below. If you are looking for a specif part number, please include it with your message.